Detailed review of Olay Total Effects 7-in-1 Face Moisturizer. See what real experts and actual users have to say about this moisturizer. 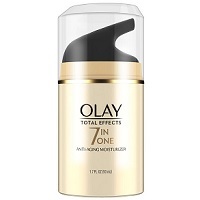 Olay Total Effects 7-in-1 Face Moisturizer is a really popular face lotion and is available almost everywhere. This isn’t the cheapest moisturizer – at $30 for almost 2 oz, I was expecting some good results. Unfortunately, I didn’t really see much of a difference after a while, so I had to give it 2 out of 5 stars. This moisturizer is fragrance free, but I thought it had a really light smell of sunscreen. The consistency wasn’t bad, but I felt like I had a waxy film on my face after it soaked in. Another issue I had was the ingredients. It doesn’t have parabens, but it does have red 40 and yellow 5, which seems unnecessary to me. Overall, it made my skin feel a little softer at first, but really didn’t do anything for my skin in the long run. For the price and the boring ingredients, I wouldn’t recommend this face lotion. Olay Total Effects 7-in-1 Face Moisturizer kind of reminded me of a thinner sunscreen. It isn’t greasy or anything, it just didn’t really ever feel like it totally soaked in. This is one thing I really liked about this moisturizer. The pump applicator works great and is super easy to use. I always like when I don’t have to scoop the moisturizer out with my hands, which can get really messy. Just one pump gave me plenty of lotion to cover my face and neck. I almost didn’t need a full pump. Drying time was average. It probably took more than 5 minutes to feel like there was nothing sitting on my skin. It didn’t feel sticky or anything, but it did leave a waxy feeling on my skin for a while after I applied it. Olay Total Effects 7-in-1 Face Moisturizer is fragrance free, which is great for anyone who is sensitive to fragrance. Weirdly enough, “fragrance” is still listed in the ingredients. Which I think is good to know for those of you looking for a truly fragrance free product. It is recommended that this moisturizer is used daily, so I made sure to apply it every morning. I did notice it made my skin feel pretty soft right after I applied it, but it wore off after an hour or so. It went well under my make-up, which is another plus if you are looking for a moisturizer to use in the morning. Longer term is where this went downhill for me. I really didn’t notice any improvement in the look or overall feel of my skin. My fine lines and pore size didn’t change and definitely didn’t improve. I didn’t have any breakouts or acne, but I also didn’t see any good aspects of this moisturizer either, which is why I ended up giving it a 2 out of 5 stars. Olay Total Effects 7-in-1 Face Moisturizer has some good ingredients, but definitely some weird, bad ones too. One of the first ingredients listed on the box is niacinamide, which is Vitamin B3, which is great! Vitamin B3 is essential for healthy skin. It can reduce pore size and mostly improve discoloration in the skin like dark spots. Tocopherol acetate is also one of the main ingredients listed, which is Vitamin E. Vitamin E is an antioxidant, which means it fights free radicals, which can damage the skin. This can help skin stay looking young and healthy. I thought it was important to note that there are more than just a couple of preservatives in this moisturizer. Of course, preservatives are important for keeping the moisturizer safe to use over time, but sometimes I have to wonder how many are really necessary. Some of the preservatives in this moisturizer are phenoxyethanol, sodium benzoate, caprylyl glycol, BHT, and triethoxycaprylylsilane. Another weird ingredient is Red 40 and Yellow 5. I am not really sure what the purpose of the dyes are here, but why would I put that on my skin if I don’t have to? None. Olay does not accept returns once the items have been opened. To buy Olay Total Effects 7-in-1 Face Moisturizer, click here. Price It’s $17.35 per oz.